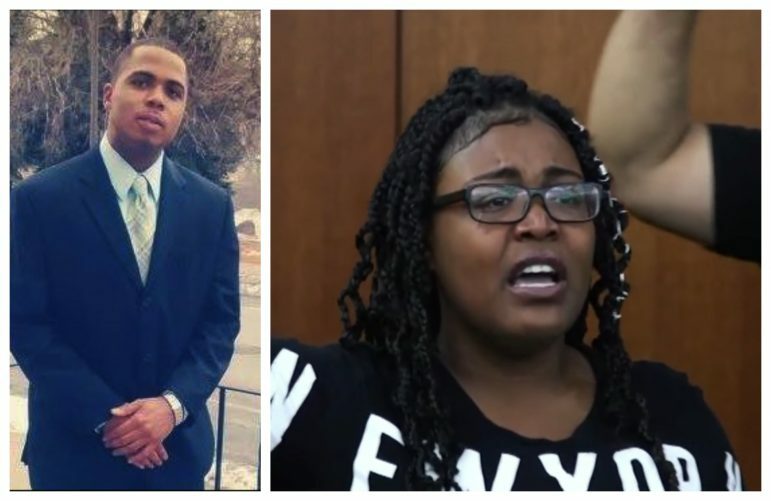 No charges will be filed against the Minneapolis Police Department (MPD) officers responsible for fatally shooting Thurman Blevins, announced Hennepin County Attorney Mike Freeman during a tense press conference on July 30. Blevins, 31, was shot and killed in the Camden neighborhood on June 23 by MPD officers Ryan Kelly and Justin Schmidt who were responding to a 911 call of an intoxicated man shooting a handgun in the air and at the ground. Civil rights attorney and community activist Nekima Levy-Armstrong, however, challenged Freeman’s concerns for the community. “You have justified police murder since you’ve been in office Mike Freeman,” she said while commandeering the conference alongside Blevins’ family and community members. On July 29, the City of Minneapolis released the raw body cam video from both police officers, as well as video stabilized and analyzed by a third-party entity contracted by the Bureau of Criminal Apprehension (BCA). The video was slowed down at various points when it appeared to show Blevins with a gun, including at the time he is shot. Minneapolis Mayor Jacob Frey, who spoke at a press conference Sunday following the video’s release, said that the City did so “in the interest of full transparency” and that transparency is a necessity for “good governance.” Frey added that the early release of the tapes — just one day prior to Freeman’s decision —was contingent on consultation with the Blevins’ family and the completion of BCA interviews with witnesses. Freeman said his decision to not file charges, which he made last week, was based on camera footage, along with forensic evidence and witness testimony. He also said the officers’ actions were justifiable under the law of using deadly force. turned toward the officers, Mr. Blevins represented a danger to the lives of Officer Schmidt and Officer Kelly and members of the community,” said Freeman. Both officers remain on paid leave while the MPD finishes their internal investigation. Minneapolis Police Chief Medaria Arradondo cited the investigation as the reason he would not comment on Freeman’s decision. “We are here today for the truth and for justice,” added Blevins’ cousin, Sydnee Brown, who is serving as a spokesperson for the Justice for June Committee. “The family is hurt; the family is devastated. We knew everything was going to play out exactly the way it played out. Officers avoiding charges in fatal shootings in Minneapolis – like the deaths of Jamar Clark, Philando Castile, Phuong Lee, Justine Damond, Terrence Franklin and, now, Thurman “Junior” Blevins, have become part of a systemic trend spanning the country. In 2018, 584 people were shot and killed by police per the Washington Post. Between 2005 and 2015, more than 1,000 officers were involved in fatal police-involved shootings, but only 54 of them were charged with a crime, according to the same report. A study conducted by Bowling Green University also showed that 98 percent of fatal shootings by on-duty officers were deemed justifiable in 2015. There are only two cases in recent Twin Cities history in which charges have been filed against officers involved in fatal shootings: that of Philando Castile and Justine Damond. The officer who shot and killed Castile was acquitted of all charges by a jury and Damond’s case is still in progress. In separate statements, the NAACP and the American Civil Liberties Union (ACLU) both condemned Freeman’s failure to file charges and the MPD officers’ actions. “There was no questioning. There was no investigation. There was no attempt at de-escalation. The police escalated the situation rather than diffusing it — ultimately leading to Blevins’ killing,” said John Gordon, executive director of the Minnesota ACLU. Blevins’ family just wants justice. Protests have been planned throughout the week in response to the lack of charges.